A lead-alloy pilgrim's ampulla of medieval date, c.AD 1350 - 1550. The body of the ampulla is circular with an elongated rectangular neck extending from one edge. The remains of two attachment loops project to either side of the neck where it meets the body. The opening at the top of the neck has been pinched shut. On one side of the rounded body of the ampulla there is moulded decoration in the form of a scallop shell. This design is often asssociated with St James of Compostela or more generally as a symbol of pilgrimage. The reverse of the object is undecorated aside from traces of lines comprising a portion of an arrow an inverted triangle or a letter W. This may represent Walsingham, but may also signify Virgo Virginum (Virgin of Virgins). In the centre of the scallop moulding on the front is a deliberate puncture made by a pointed blade or other object, which is matched on the reverse by a smaller hole. This was possibly done to release the contents as part of a blessing. 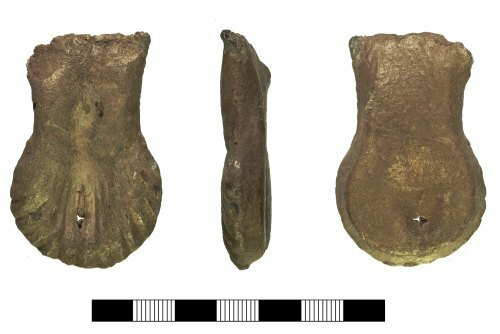 It has been suggested from a number of similar finds unconnected with religious sites in East Anglia that such ampullae could have been pierced and discarded in a religious ceremony to bless fields using holy water. Ampullae were an important pilgrim souvenir known to have been in use from the late 12th century and were designed to contain a dose of thaumaturgic water, which would have been given to pilgrims at holy shrines and wells. The water would be taken as a cure to illness or disability or worn as a talisman. The popularity of ampulla dwindled in the early 14th century, giving way to pilgrim badges, however it is believed that they continued in use to the end of the 15th century. Ampullae were available at a number of shrines, and thanks to returning pilgrims or to local entrepreneurs, probably featured as secondary relics in virtually every English parish church during the high medieval and late medieval period.